Well another week of totally bizarre weather. On Thursday, at the market, the weather was all over the place. One minute it was beautiful blue sky with lovely sunny weather, the next it was absolutely bouncing down with pea sized hail stones or torrential rain. My poor chickens don't know whether they're coming or going and spend their time dashing in and out of their chicken house like mad things depending on what the weather is doing. It's quite funny to see them scuttle off in to their house when the first hail stones start falling and then tentatively poking their heads out when it stops, just to make sure it's safe to some out again. These guys weren't so lucky and had to take shelter under the hedge. 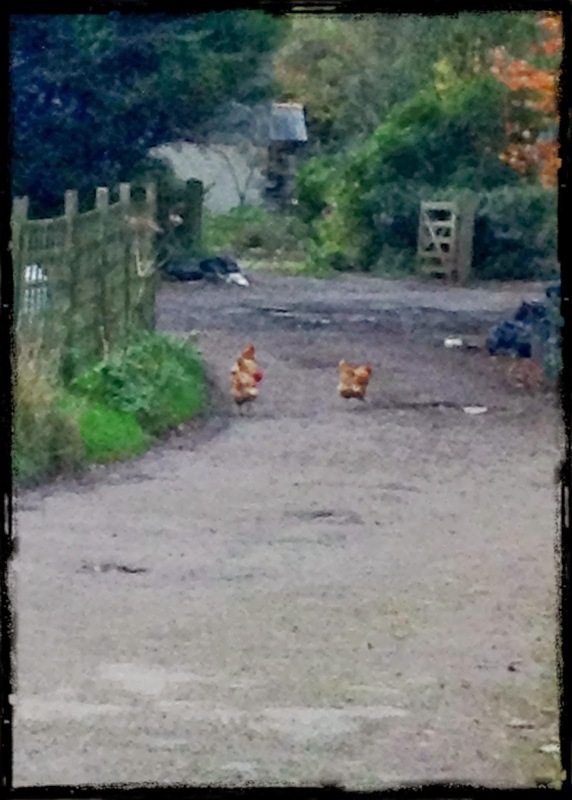 They live about a quarter of a mile up the lane and they are truly free range chickens, they regularly wander down to say hello to my girls and have, on occasion, left me an egg as a present on the gravel where I park my car. Because the weather has been so awful I am now in full-on-winter-hibernation mode. This includes being in soup and casserole mode. I love stews and casseroles. I always make it with loads of veg, usually whatever I have in the house but, at the moment, my favourites are carrots, butternut squash and sweet potato. I read somewhere that the orange pigment found in carrots is due to the antioxidant beta-carotene, also found in other deep orange foods such as sweet potatoes, pumpkin, butternut squash and papaya and that Beta-carotene is converted to vitamin A in the body which helps to maintain healthy eyes, support your immune system, keep your skin healthy, and is thought to protect against certain cancers. An added bonus to the fabulous taste in my opinion :-). I also usually add some meat to my casserole. I prefer beef or lamb but whatever meat you like will work just as well, with enough stock to cover everything. The whole thing is then simmered slowly in the oven in my oh-so-cute, pink, cast iron casserole pot et voila, it turns into the most delicious stew. The flavours are rich and deep and the meat is so tender it melts in your mouth. The same goes for soup. I love homemade soup. It always feels as if it's good for you. My favourite at the moment is watercress and potato. Silky and smooth, it has a lovely earthy flavour and the watercress adds a delicate peppery-ness which is delicious. And with all the veg in there you just know it has to be good for you. The other thing I tend to do when the weather is not very nice is bake. While the oven is on cooking the casserole, I always try and put something else in there with it so it's not such a waste of energy so, I bake. Cakes or cookies or maybe a crumble. Anything I can think of really that will go nicely with a steaming mug of tea or a smooth frothy coffee or with some thick Jersey cream for pudding. As with everything else, when I bake I do tend to wing it slightly. I know you really aren't supposed to but if I don't have a particular ingredient I substitute something else. I made some chocolate chip cookies the other day but I didn't have the right kind of sugar it needed for the recipes so, I substituted the light muscovado sugar for some dark brown sticky sugar I had in the cupboard. The cookies were completely delicious, they had a chewy caramel flavour to them and quite frankly, they didn't last very long at all. I much prefer homemade soup, our favourite is minestrone. I bag up mixed veg grown in the garden in the summer & freeze it ready for winter soups. I'm pretty sure it is against the law just to eat one cookie. They aren't actually my chickens Claire, mine live on my front lawn, the ones in the picture are free range chickens that come to visit mine every couple of days or so, they actually live about a quarter of a mile up the lane. I think it's because I have nicer chicken food than where they live :-)and butternut squash and peanut soup sounds utterly delicious! Just love your biscuit tin. 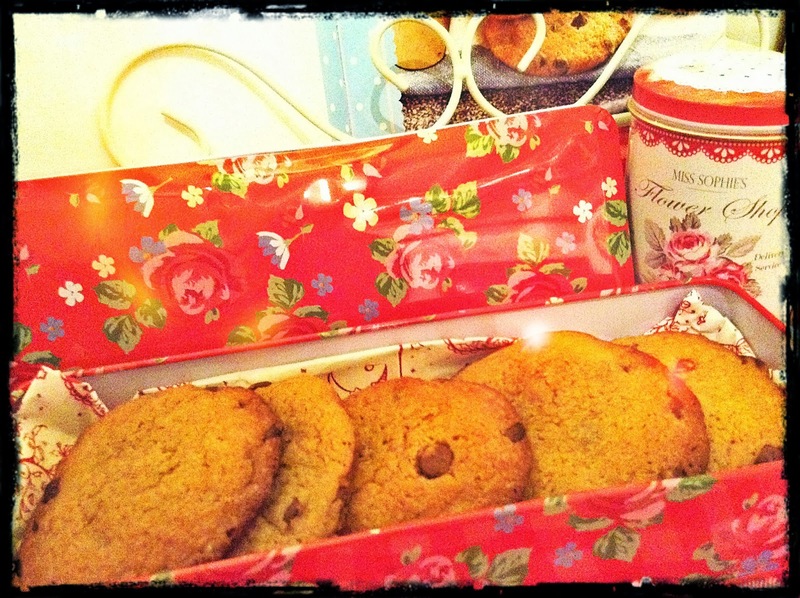 If I had one I too would bake biscuits just to open the tin. Your biscuits loof great. I eat home made everything just about, I made choc chip cookies last week and chopped up bars of chocolate as I will not pay through the nose for little bags of ready made chips. I never go out to buy a single ingredient there is usually a substitute in the pantry. The last batch of carrot cake that I made were half apple half carrot and were very tasty. 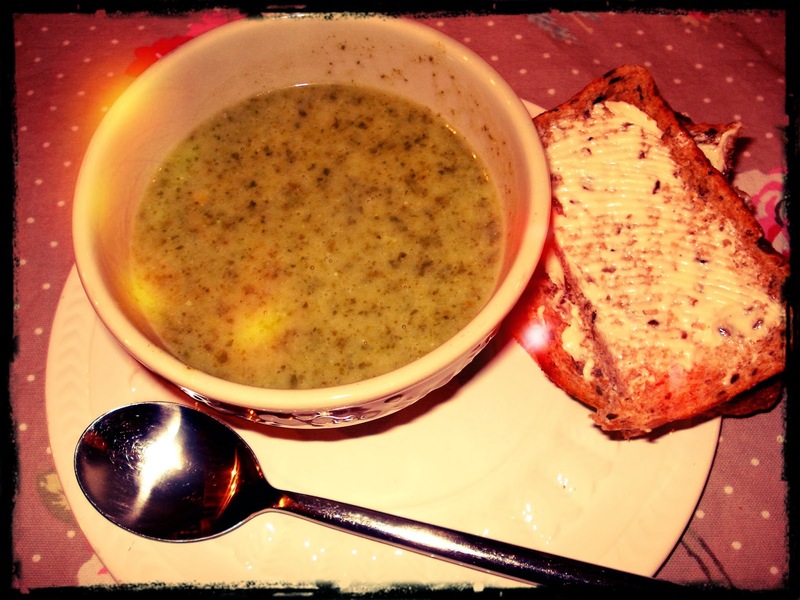 Homemade soup is far tastier than any you can buy and you know what you put into it. I prefer beef stews but always love loads of veg with it and of course dumplings or yorkshire puds too. I always have the urge to bake puddings and cakes at this time of year. P.S. Really jealous you have chickens! !